Be sure to read more about the bold words in the “Did you Know? Section” at the end of this post. As one of three long-term residents at the Mabelle Arole Rehabilitation Center, Hirabai is a near constant presence at CRHP’s Demonstration Farm. Whether she’s managing the vermicompost demonstration, assisting in the nursery, or chatting to our various guests, those who meet her can be assured of meeting a vivacious, hardworking, and courageous woman. 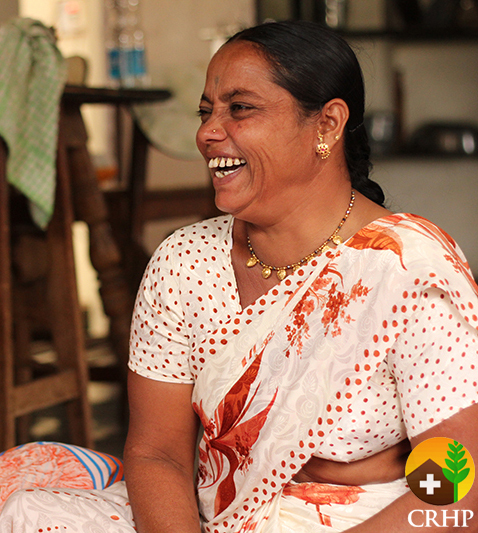 Hirabai grew up with her two younger brothers in one of CRHP’s project villages, Padali. Her parents were bonded laborers–modern day slaves who enter servitude to repay debt. Like most bonded laborers, her parents worked long and difficult hours on the farm, sometimes even working through the night. Hirabai had to stay in their home, a tin shack on the perimeter of the landowner’s farm and do the housework while her brothers went to school. At the young age of 14, Hirabai’s parents married her to a boy four years older. The first four years of her marriage were marked by verbal abuse, an unfortunate outcome for many arranged marriages with child brides. She says, of her first four years of marriage, “My husband detested me. He spoke to me only when he wanted to insult me.” While Hirabai stayed in her husband’s house, he slept in a hotel or a grocery store. He complained to his parents that he wanted to marry another woman because she was “fat and useless.” Eventually, his parents convinced him to start living with Hirabai, and she became pregnant within months. She delivered her first daughter, Rani, at the age of 19 and shortly after had two sons: Shriram and Vishal. Hirabai’s husband started a grocery store more than 20 km from their village and spent the majority of his time there, coming home only once or twice a month. During this time he began abusing alcohol and unknowingly contracted HIV. He was diagnosed after his parents admitted him to a nearby hospital with a severe fever and diarrhea when his youngest son was just 5. Hirabai and her children were tested for HIV; she alone tested positive. Upon returning to the village, her husband’s parents took gentle care of him until he died one year later. Hirabai, however, was snubbed by her in-laws due to the stigma attached with HIV. She was not allowed to touch the food or water, bathe in their bathroom, or sleep in the house. Despite this adversity, Hirabai remained healthy for seven years while she worked on farms to earn money to feed her children. When she got sick her in-laws would not care for her so she called on her younger brother. He took her to the hospital where she briefly recovered before falling sick again. Her parents took her into their home in Padali, but they were growing old and had very little money. When they were no longer able to care for Hirabai, they took her to Pushpa, their Village Health Worker, who listened to her story and brought her to CRHP. Bonded labor: A modern day form of slavery in which a person, or often an entire family, is forced into servitude out of debt. Although illegal in India, bonded labor is still widely practiced, especially in rural areas when the landless do not have many income options. It is particularly harmful for women and children in the Dalit community. This practice is deeply rooted in India’s socioeconomic culture, a product of class, caste, religion, and poverty. HIV/AIDS Stigma: There is still a strong stigma associated with HIV/AIDS, partially due to a lack of understanding about the disease. People with HIV are often cast out from their families, ostracized by their villages, and face employment discrimination. Women are significantly more likely than men to suffer from HIV related discrimination from their families and communities. HIV positive men are often labeled immoral, yet HIV positive women are generally blamed for bringing HIV into the marriage. One study that included 682 respondents, 302 of which were in India, found that 80 percent of respondents faced discrimination in every sector of society. 2. See more photos of Hirabai.